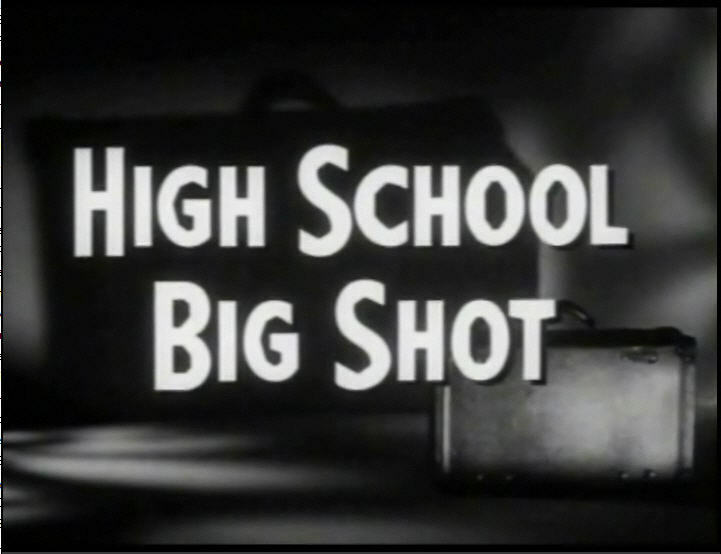 I have some time to spare this evening, and took a look at the offerings on Pub D Hub via my beloved ROKU media streamer, finding a 61 minute 1959 offering by one of our favorites, Roger Corman, titled High School Big Shot. A tragedy in every sense of the word. It's a sad old story. Boy wants girl, girl wants money, boy finds some money to steal, other boy finds out, gunfight, boy dies, girl dies, fade to black. We got Phoenix native and John Denver look-alike Tom Pittman as the first boy. He had a busy movie and TV career from 1956 until his untimely death (at age 26) on Halloween, 1958 when he expired in a traffic crash in Benedict Canyon, El Lay. Sadly, his body wasn't found for three weeks. Bummer all the way around, Tom. We got Virginia Aldridge who, after this life altering experience, turned from acting to writing, appearing later in 1967s The Gnome Mobile, and then, also in 1967, in an episode of Star Trek, her last known TV appearance. A fitting end to any actor's career. 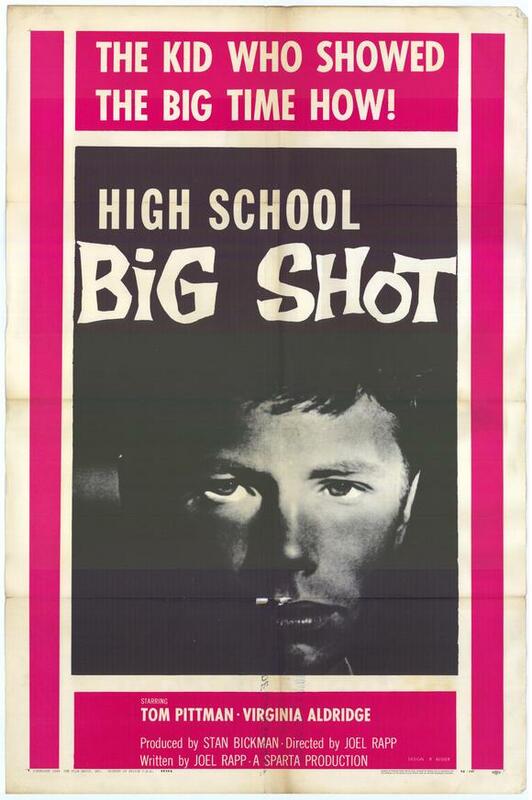 We got Howard Veit as the second boy—the bad one. 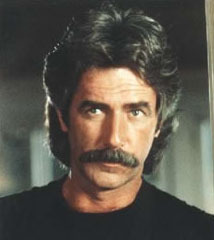 His acting career was also cut amazingly short by this experience, lasting, well, only for this one appearance. 'Course, he didn't actually seem all that bright, good looking, or talented anyhow. 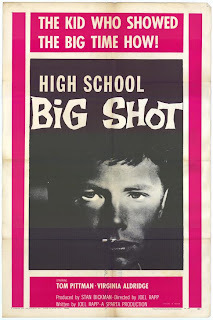 In 1965 he wrote, produced, and directed something titled Scream of the Butterfly, a movie I may try to find at some point.....and with that, we know little more about Howard Veit. Then we got Stanley Adams, one of those character actors who worked steadily in B movies and TV throughout the 50s and 60s....and 70s too, I suppose.....as Harry the Safe-cracker. Stanley played Cyrano Jones (the Tribble guy) on Star Trek, and then was also cast as a space carrot in Lost in Space. His 1977 suicide has been blamed on depression. Really? Depression? I blame the unfortunate casting as a space carrot. The best thing that can be said for High School Big Shot is that the Mystery Science Theater 3000 gave it a going-over in their 6th season. For that reason alone, this is worth a look.